Gather as many people as possible to pray with you. 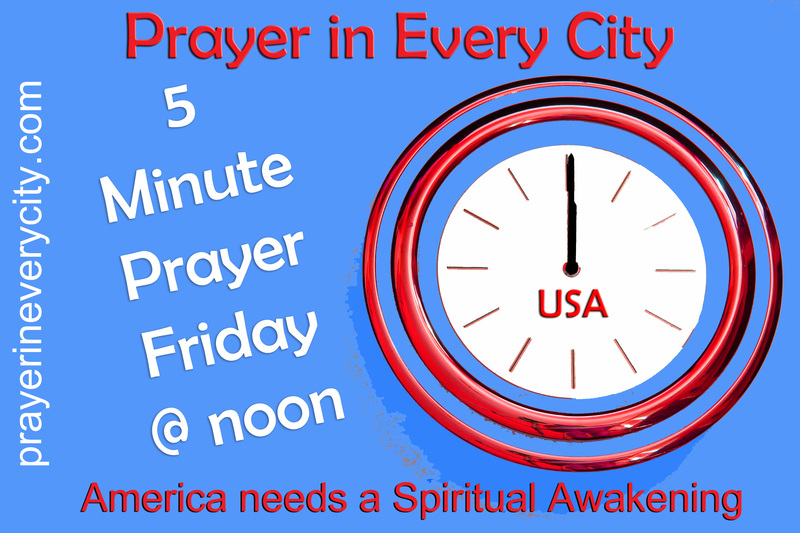 At noon today, no matter what time zone you live in, stop what you are doing a doing and pray for at least 5 Minutes for Revival and Spiritual Awakening for America and around the world. All participants should visit my blog http://prayerineverycity.com and click on the “5 Minute Prayer Friday” post so we can see how many people have prayed. Set up an alarm on your cell phone, if you have one, which will go off every Friday at noon. I have an android and use the app called “Clock”. Help me spread the word about “5 Minute Prayer Friday” by printing the free business cards below and giving them to your friends. Prayer for protection for the United States and around the world.